This guy is going to be a Ranger for the next six years. Photo courtesy of MSG Photos. The last domino has fallen into place and Jeff Gorton can check everything off of his to-do list. Early this morning, around 9:30 am, The New York Rangers and Jeff Gorton announced that the Rangers had agreed to terms with Derek Stepan on a new long term contract. The deal was six years in length for $39 million, averaging out to a cap hit of $6.5 million a year. Stepan, just 25 years old, will be a New York Ranger until the age of 31, when he will hit the market as an unrestricted free agent. This past season, Stepan finished third on the team in scoring with 55 points, despite missing a total of 14 games due to a broken leg. He also had a plus 26 rating, which was behind only Rick Nash, as well as just 22 penalty minutes. He was also just one of two players in the NHL to rank fifth or higher on his team in all of the following categories; assists (39), points (55), game winning goals (3), plus/minus (+26), shots on goal (155), power play goals (3), power play assists (7), power play points (10), shorthanded goals (2), shorthanded assists (3), and shorthanded points (5). The only other player to do that was Jonathan Toews. Stepan also set career highs in assists per game (0.57), and he average .81 points per game in 2014-15. After making his season debut on November 8th, he led the team in assists, finished second in points, and was tied for fourth in goals. There’s no doubt that if he was healthy for the entire season, he could have challenged Rick Nash for the team lead in scoring. His strong play continued into the playoffs, where he tallied five goals and seven assists in 19 games. Everyone remembers his goal in overtime to beat the Capitals in Game 7, and move onto the Eastern Conference Finals for the second straight year. If that doesn’t give you chills, I don’t know what will. On top of all of this, Stepan is one of only five Rangers in franchise history who has tallied at least 40 points in their first five, with three 50 point seasons in the last four years. He’s one of only three Rangers players, and the only forward, to finish with a plus-eight or higher in each of his first five NHL seasons. In 80 career playoff games, all with the Rangers and dating back to the 2010-11 season, he has totaled 41 points, with 15 goals and 26 assists. He’s tied for second in franchise history in playoff points before the age of 24, and he’s one of just three forwards to skate in at least 80 playoff games. The US Olympian and 2010 World Junior Champion was selected by the Rangers in the second round of the 2008 NHL Entry draft, selected 51st overall. Stepan would have had his best season if it wasn’t for the leg injury. As soon as he started playing games, it seemed as if he was getting a point per game, always creating offense as well as playing arguably the best three zone game on the entire team, surpassed only by Rick Nash. 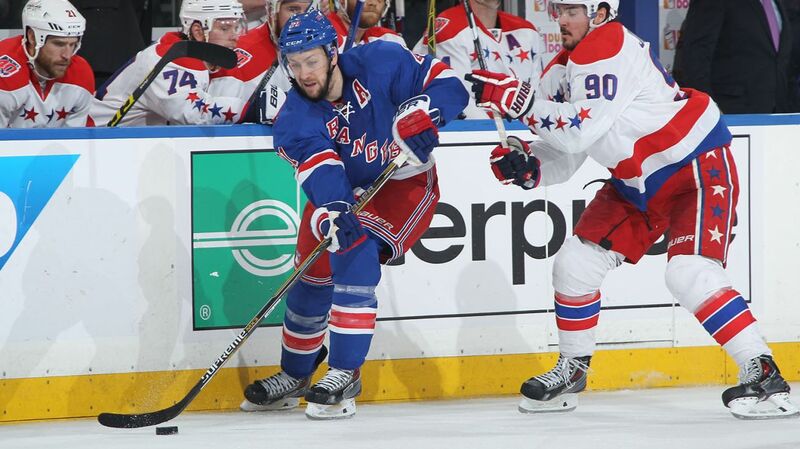 Stepan is a complete, three zone player who plays strong, smart hockey on both ends of the ice. Photo courtesy of MSG Photos. He’s built considerable chemistry alongside Chris Kreider, with whom he has been paired with for the last few seasons. The Rangers did not play as well when he was injured, and locking him up long term was a very good move by Jeff Gorton. Stepan’s playmaking, defensive play and leadership is invaluable, and the Rangers continue to keep their young core with the team. For me, I’m pretty happy with the deal. I thought that $6.5 million was about as much as he should get, and it was about a million less than what people anticipated that he could get. For a 25 year old player, improving every year into a potential 60-70 point player and maybe even a Selke Trophy Candidate, it’s a really nice deal. Stepan makes those that he plays with better, and it will be nice to see Stepan and Kreider hopefully play together for years to come. The money may high, but this deal will pay dividends in a year or two when Stepan develops into a 65+ point player, and when players of his caliber are making $1 million or more than he is. This is the potential lineup for next season. That’s one heck of a lineup, with a lot of depth, an improved bottom six, and the same strong defense and goaltending that has carried the Rangers for years. With Stepan having signed on the dotted line, the Rangers will have about $850,000 left in available cap space, which is with me assuming that Oscar Lindberg claims no less than a spare forward roster spot in September. Again, that is more space than anyone expected to have heading into the season, and it leaves room for call-ups and anything else that the team needs to do. 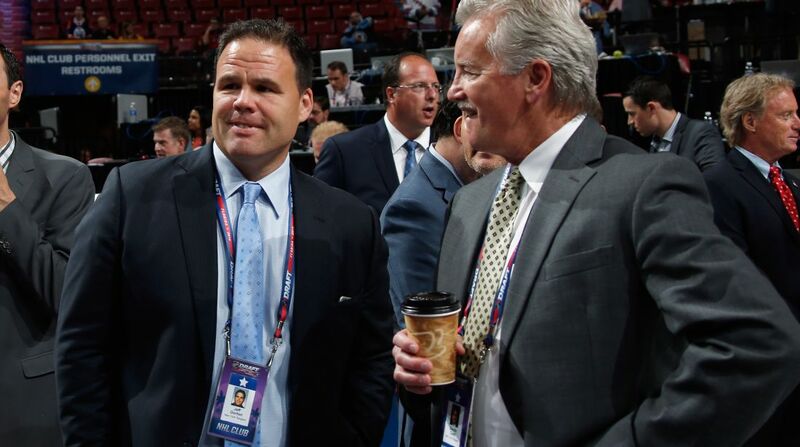 In Jeff Gorton we trust. In Jeff Gorton we trust! Photo courtesy of the New York Rangers. Posted on July 27, 2015, in Rangers Updates and tagged Carl Hagelin, Chris Kreider, Derek Stepan, Jeff Gorton, JT Miller, Kevin Hayes, Madison Square Garden, Martin St. Louis, MSG, New York Rangers, New York Rangers blog, NYR, Rangers, Rangers blog, Stepan arbitration, Stepan cap hit, Stepan contract. Bookmark the permalink. 4 Comments. Not a bad move… and makes him MUCH easier to trade if he gets convincingly outplayed by Hayes. I think teams would line up to get Step at that Cap Hit and already locked in for that many years. .
First two years there in no clause. I THINK that is because those are RFA years and by league rules you cannot have an NTC or NMC during RFA years. I’d have to look at the CBA. For the following two years of the contract, I hear he has a full NTC. For the final two years of the contract, I believe he has a limited NTC. He will have to submit a list of 15 teams he would agree to be traded to during those final 2 contract years.